If you need a T-shirt that offers extra warmth for your arms, you will find a wide selection of long sleeved T-shirts for both work and leisure at MASCOT. 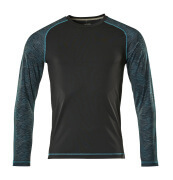 The MASCOT long sleeved T-shirts work perfectly separately or in combination with other tops. For example, you can use a long sleeved T-shirt as the inner layer of clothing when you dress after the layering concept. In MASCOT® ADVANCED, you will find i.e. 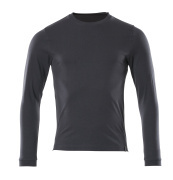 a long sleeved T-shirt of a quick drying and moisture wicking material, which effectively leads moisture away from the body. It provides you with optimal comfort and a nice body temperature no matter if you are physically active in cold or in warm environments. The MASCOT long sleeved T-shirts are available both in single coloured and two-toned variants so you can easily find the colour that you prefer, and you can match the product with your additional MASCOT workwear. 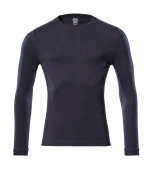 The MASCOT long sleeved T-shirts are available in a modern fit that gives you great freedom of movement. The assortment also offers long sleeved T-shirts designed with a comfortable inner side of cotton, placed towards the body, and durable polyester on the outside so the T-shirts can withstand a lot. In addition, several of the long sleeved T-shirts from MASCOT have extra padding over the seams at the neck so they won’t bother. 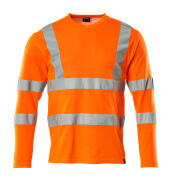 If you work in a high-risk area with requirements for visibility and safety, you can find long sleeved T-shirts in fluorescent colours in MASCOT’s assortment. If you have a job where you need multi-protection, you can also find a long sleeved T-shirt that is both anti-static and flame-retardant.